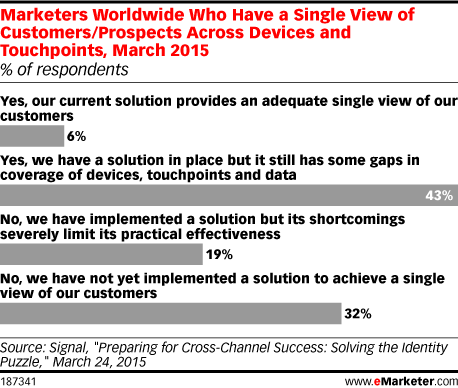 Data is from the March 2015 Signal report titled "Preparing for Cross-Channel Success: Solving the Identity Puzzle." 171 marketers worldwide from a variety of industries were surveyed during January-March 2015. Respondents were from Asia (4%), Canada (2%), Europe excluding the UK (10%), Latin America (3%), the Middle East (2%), the UK (13%) and the US (66%). Respondents identified their job level as C-level or senior-most executive (9%), contractor (4%), director (22%), manager (24%), practitioner (9%), team lead (15%), vice president (12%) and other (5%).